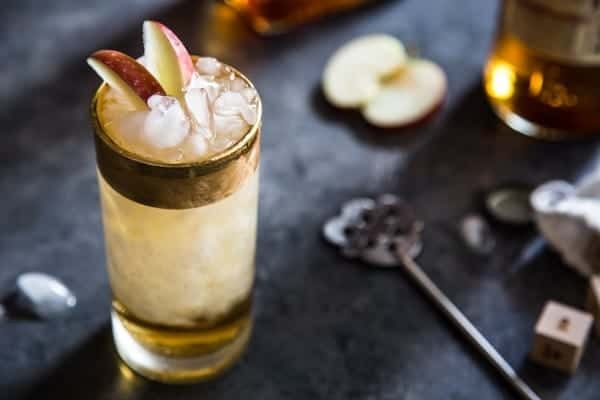 Richly spiced rum and tangy hard apple cider come together in the ultimate summer/fall cocktail mashup: The Apple Cider Swizzle. Emily’s here to share this new Apple Cider Swizzle recipe with you while I’m on a little adventure with the family. I know you’ll love it, and plenty of the other drinks on Emily’s blog, Jelly Toast. Thanks, Em! I love a seasonal cocktail. There are certain times of the year when various cocktails just make the most sense; like a Hot Toddy in the winter and crisp, fresh Mojito in the summer. The same goes when it comes to flavors. Fresh berries in sangria during the hot Summer months hits the spot while anything with apples in the Fall is totally what I crave. Now that it’s September, I am getting into full apple swing. The problem is, this stubborn Midwest weather has not wanted to cooperate. This week, it’s decided to be 85 degrees with humidity. Not exactly what I think of when I think of Fall. So, while I’m not dusting off my sweaters and boots just yet, I am determined to start easing into my favorite Fall flavors, while keeping things cool for this clingy, muggy weather. That’s where my Apple Cider Swizzle comes in handy. If you have never tried a swizzle before, now is the time. A swizzle is a classic cocktail that dates back to before big frozen blended drinks came into popularity. 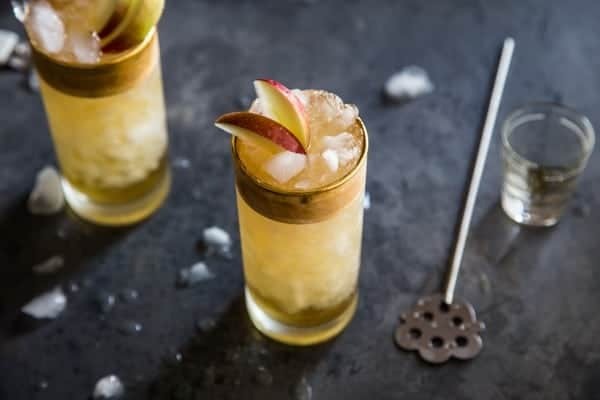 The key characteristic of a swizzle is building the drink in a tall glass of crushed ice, and after it’s been “swizzled” the glass becomes incredibly frosty. A swizzle stirrer is a simple stick with a small paddle end or a stick with a few little pieces sticking off the bottom that act as blenders when being used. There are several styles but a bar spoon can also be used in the absence of a more traditional swizzle stick. To swizzle the drink, place the swizzle stick or bar spoon, paddle/spoon end down, into the crushed ice and liquor. Spin the swizzle stick between your palms for a minute or two or until your glass becomes nice and frosty. 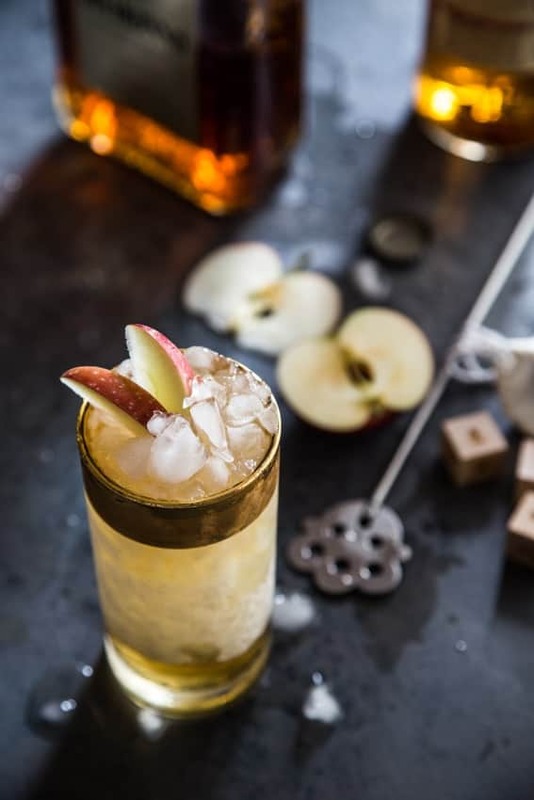 This Apple Cider Swizzle was inspired by my Rum Orange Swizzle. For this version, I used spiced rum, a touch of maple syrup and Amaretto for depth and warmth. 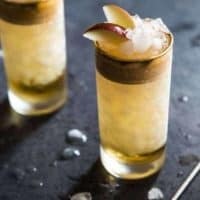 I topped each cocktail off with a couple of ounces of my favorite hard apple cider and a few dashes of bitters for good measure. The results were the perfect combination for late summer/early fall sipping. The best of both worlds! Fill a collins glass halfway with crushed ice. Add rum, maple syrup, Amaretto, and hard apple cider. Using a swizzle stick, swizzle the drink until well mixed and the glass turns frosty. Top with bitters and additional crushed ice. 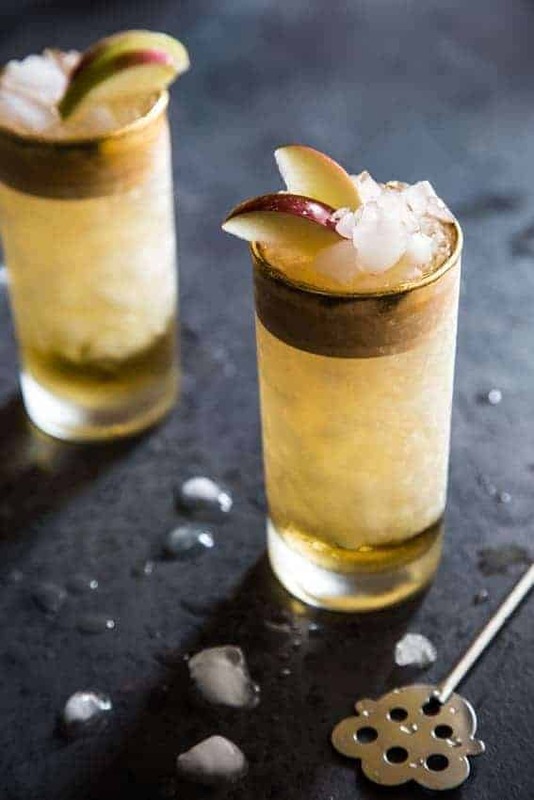 Garnish with apple slice and serve. Looks like a refreshing drink anyone can do. It’s almost apple-picking season; so, we’re excited to make anything apple-ish. Also, I TOTALLY TOTALLY agree with you about the “stubborn Midwest weather.” I used to live in the Midwest; and, wow! What crazy tornado weather!